We are the prominent manufacturer, exporter bottle washing machine. 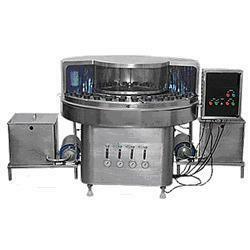 Our firm holds expertise in offering an exclusive array of Semi Automatic Rotary Bottle Washing Machine. Precisely designed using qualitative raw material, these machines are highly useful in washing 60 ml. to 1 Ltr. bottle. We offer these washing machines at competitive prices to our clients. ü Four inner (Included one air wash) & one outer. ü Sequence of washes to customer's choice. ü Stationary nozzles eliminate contamination of water cycles. 0.5 HP/ 415 Volts/ 50Hz. 1 HP x 2 = 2 HP 415 Volts/ 50Hz. Looking for Automatic Washing Machine ?